So began the BiOS Hot Topics session at SPIE Photonics West in January, where roughly 1000 audience members heard about breakthroughs and challenges on subjects ranging from early cancer detection with coherence imaging to advances in fluorescence and optoacoustic imaging for a variety of applications. Daniel Palanker of Stanford University brought my favorite. He described a photovoltaic retinal prosthesis for restoring sight to the blind, promising improved vision for patients with age-related macular degeneration and other vision disorders. “The field last year went from science fiction to clinical reality,” he said. Brian Jet-Fei Wong of the Beckman Laser Institute and Medical Clinic at UC Irvine said that Palanker’s prosthesis was something right out of Star Trek before presenting his own work on optical coherence tomography in the head, neck and upper airway. He described emerging OCT applications for obstructive sleep apnea, neonatal monitoring and more and, as he concluded his talk, encouraged more people to get involved in anatomical OCT.
Those are just two of the nine outstanding Hot Topics presentations given that night; I urge you to visit www.spie.org/bios and read about the rest. I also attended a session on cardiovascular spectroscopy, chaired by Laura Marcu of UC Davis. In that session, Christine Fleming of Massachusetts General Hospital/Harvard Medical School presented research into the classification of atherosclerotic plaques using depth-resolved spectral analysis of optical frequency-domain imaging data sets. The goal of the research is to reduce ambiguity when identifying lipid-rich regions of coronary artery plaques. Of course, I barely scratched the surface. If you’ve attended a large show and conference such as Photonics West, you know that careful planning is required to get the most out of the event. Our attendance at meetings and trade shows is one more way Photonics Media is working to keep you informed. The 2011 Prism Awards for Photonics Innovation, co-sponsored by SPIE and Photonics Media, were presented during Photonics West. The Prism Award in the Life Sciences and Biophotonics category went to 89 North of Burlington, Vt., for its Heliophor pumped-phosphor light engine for quantitative fluorescence microscopy. Heliophor allows high-speed, live-cell imaging without additional equipment such as shutters and controllers. Unlike currently available light sources such as LEDs and metal halide, the Heliophor’s pumped-phosphor technology allows production of a wider range of output wavelengths, all matched to common fluorescent proteins and dyes. The high-speed switching afforded by the pump source allows the light source to serve as its own shutter, while the internal feedback system maintains ultrastable output power. Our congratulations to all the Prism Award winners as well as to all those who participated in the symposia and posters to enrich our understanding of what is possible with photonics. What we saw and heard at Photonics West will certainly help inform our thinking about photonics and the industry over the coming months. For more of our reporting from the event, see the Light Matters Weekly Newscast episodes from Jan. 23 and Feb. 1 at Photonics.com. In this issue of BioPhotonics, we take a close look at imaging and spectroscopy in the development and manufacture of pharmaceuticals. Features editor Lynn Savage suggests that surface plasmon resonance techniques show an affinity for identifying novel drug candidates. 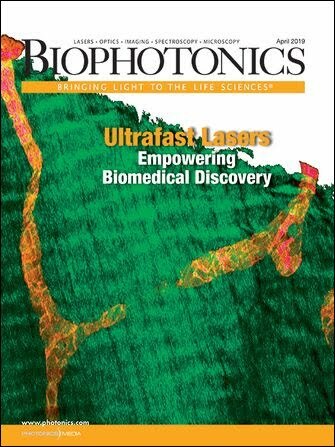 In “SPR Provides a Boost to Drug Discovery and Development,” he writes, “Unlike with fluorescence detection … SPR requires no extraneous photoemitter, or label.” The article begins on page 26. Lynn Savage also contributes some current thinking on the use of terahertz-based techniques in the pharmaceutical industry for nondestructive, real-time product analysis. In “Terahertz Techniques Reveal the Hidden World of Pharmaceuticals” (p. 38), he reports that advances in terahertz imaging and spectroscopy are making it easier for pharmaceutical researchers and manufacturers to predict crystal structures of common and uncommon drugs and to distinguish among drug polymorphs. While at Photonics West, our Light Matters Weekly Newscast crew filmed attendees talking about how they are using light to change the world. Watch for their comments at the end of upcoming Light Matters segments on www.Photonics.com, and let me know at karen.newman@photonics.com how you are changing the world with light.